Description: The Cross with roundish ends and the rounded corners. Such form is characteristic for wide group of crosses XIV-XVI of centuries. FRONT CROSS BAR. a representation of the "Diesis" - by tradition a representation of the Christ with the Virgin Mary on His right and St John the Baptist on his left. FRONT CENTER. 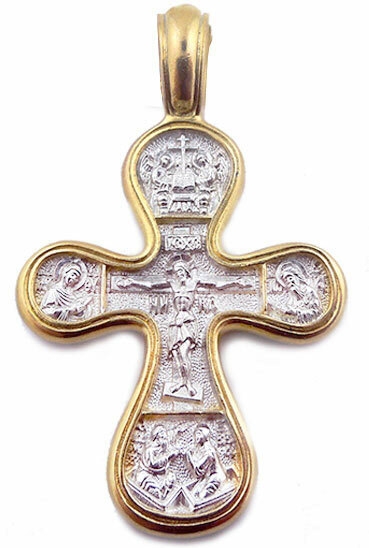 The center portion is a traditional representation of the crucifixion. FRONT LEFT AND RIGHT LOBE. To Christ's right is the Virgin Mary His Mother whose right hand is pointing to Christ (in Greek this is known as the Hedgitera) as "the Way". St John the Baptist - the Forerunner of Christ is to His left. Bottom two Cherubim in supplication before their crucified Lord. VERSO TOP. Christ Almighty holding a Gospel Book. CENTRAL ICON. A representation of the "Virgin of Procrov (Protection)". By tradition both the Cities of Constantinople (from the Turks) and Kiev (from the hordes) were protected from a hostile attacked by the Virgin who appeared over the city holding her veil in protection. LOWER PORTION . SS Peter and Paul. St Peter was the "first" of the Apostles and the bishop of Rome. St Paul originally persecuted Christians later becoming one of the prime exponents of the church. SIZE with the bail: 1 3/4" x 1", size without the bail: 1 1/2".